Former NBA All-Star Vin Baker Now Working at StarBucks -and That’s Great! At a press conference on Tuesday, reporters asked Tiger Woods about retiring to which the 39-year-old pro-golfer replied, “yeah, umm, retirement? <coughs> uh, I don’t have an AARP card yet so…” (laughter ensues) Well, apparently laughter was not ensuing over at AARP. The retirement organization took to Twitter after Woods’ abysmal first round at The Open Championship on Thursday afternoon in Scotland -a 76-stroke score, his worst in four Opens there -and fired back a biting Tweet: Touché, AARP! Touché! 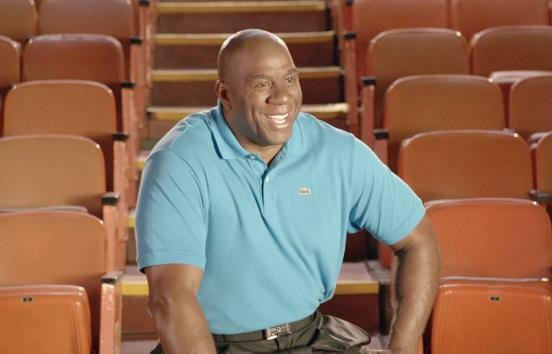 It's been over 20 years since Magic Johnson announced to the world that he was HIV positive and changed the face of AIDS. "Because of the HIV virus I have attained," he said. "I will have to retire from the Lakers." But he didn't retire from life, as he became a successful businessman, a television host, an advocate and a grandfather. Magic and his wife Cookie talk about how difficult that day was and the events that led up to it in the documentary "The Announcement", directed by Nelson George. "It's not so much what people said about him, it's how he felt and what people did to him," George said. "Be it people dis-inviting him to their restaurant or dealing with how [the drug] AZT affected his body. It's an inside-out view as opposed to the things you might have heard discussed on talk radio." The Announcement airs on ESPN tonight at 9pm. Grant Hill Shuts Down Fab Five’s Jalen Rose in NY Times Sports Blog!